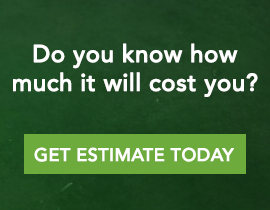 Learn about our options and pricing. Concrete Polishing is increasing in popularity, not only for its clean, sleek, and modern appearance, but for its cost effectiveness, sustainability, durability – with very low maintenance cost. 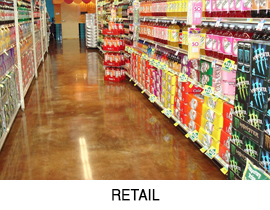 Retail, Commercial, Restaurants, Spa and Hair salons, Churches, Grocery Stores, Schools, Warehouses, and Residential Homes are selecting Polished Concrete for their flooring systems. With a Stone Medic Polished Concrete Floor, you can save thousands in floor maintenance – or you can pay, and keep paying, for floor finishes that require frequent maintenance, reinstallations, and costly upkeep. Invest one time in a beautiful, quality, Stone Medic Polished Concrete Floors. 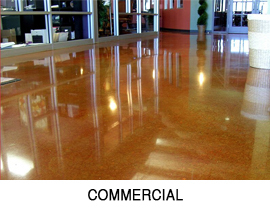 Concrete Polishing is not like any other flooring finishes. There is simply no comparison to other floor systems when it comes to the life of polish concrete system. Even the most durable carpet, linoleum, or VCT floors will require replacement at some time. Polished Concrete floors will be there as long as the slab exist – fifty or one hundred years. Routine cleaning is all that is required to maintain a smooth, dense, glossy floor. 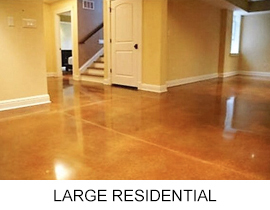 Polished concrete floors can be put into service immediately after the process is complete. Stone Medic Concrete Polished floors will never have to be replaced, reapplied, recoated or waxed. Maintaining your polished concrete floors will only require routine maintenance.